Sign your kids up for creativity galore! Strengthening the child's identity is the starting point. We take into consideration each child in their current capacities and their level of maturity and allow for the spontaneous expression of their creativity and affectivity in each class. Dances and games in Biodanza exert a restorative effect and can strengthen the identity of children (self-esteem) and encourage their enjoyment of life. We structure the classes by age groups to maximize this potential. Biodanza exercises are structured in relation to its integrating effect - enhancement of organic unity and homeostasis of the body. In particular, Biodanza enhances motricity conditions (elasticity, elongation, agility, rhythm, flow, harmony, etc. ), sensitivity and the act of being bold that brings to fruition creative acts in the human being . Bidoanza enables the child's perception of his emotions which, indeed, can be expressed through movement, preventing psychosomatic symptoms and encouraging inner creativity . Our ultimate goal is the expression of emotion, often so intimate a feeling that is not often possible to show within the family itself. The feeling of belonging to a group is a vital engine for the child. Isolation breeds discontent. In Biodanza, we welcome the child into the fold weekly and create a safe and contained space. Biodanza seeks to promote the harmonious integration of the group itself and each child within this context. We consider it essential that the child discovers that he can concentrate and we develop this capability for concentration with the proposition of dances/exercised that demand focus. Biodanza exercises with children are geared towards helping kids develop self-discipline and concentration. All of the above is hidden under a REALLY fun class that takes your child on a journey for one hour. They will laugh, play, socialize, learn to be quiet and harmonious with self and with others. I've never taught a Biodanza class for kids that the child didn't not love. Come give it a try! Michelle Dubreuil Macek is an IBF Certified Didactic Teacher and has also completed the Extension for Biodanza Kids/Youth/Teens in Johannesburg, South Africa with Alejandro Balbi Toro in 2008. She has been teaching children in a variety of classroom set ups since 1985 both nationally in the USA and abroad and has dancing children of her own. 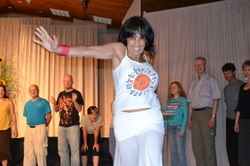 At right, she is seen facilitating at the Omega Institute in Rhinebeck, NY during family week 2010.